Prop Peter Joyce has made the move from National Two South to the Championship, after leaving Redruth to join the Cornish Pirates. The 26-year-old bowed out in style in his final game for the Reds, with a 46-24 win over Launceston. "If it had happened two or three years ago I probably wouldn't have been up to it, but now I feel I'm ready to go there," he added. After eight seasons at the Rec, it was a memorable finale for Joyce as the Reds recorded a thumping win over arch-rivals Launceston. "It's been a brilliant day, everything has gone as I'd hoped," he added. 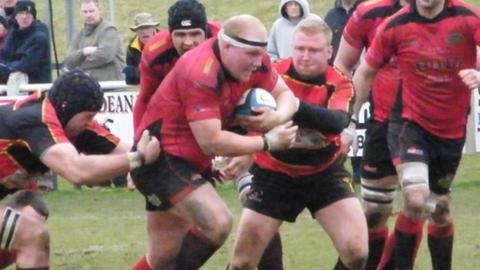 "I wanted to sign off in style for Redruth and that is exactly what we've done." Redruth started strongly, scoring three tries in the first 15 minutes. Second-rower Luke Collins scored a try in each half for the Reds, who led 46-12 with just minutes remaining, before the Cornish All Blacks scored two tries late on. That gave them a four-try bonus point, but it was Redruth who held on to secure a maximum five points with the victory.